The big and sturdy Thuvarai (Toor as in Toor Daal, Pigeon Pea, Cytisus Cajan) has been one of the greatest gifts of and for our land. While Casurina trees have reduced soil salt and Castor has penetrated its roots deep down to get water for its neighbours, it is Thuvarai that has transformed the soil in a very scalable manner. As a little backdrop, the land we bought was heavily fertilized for many many years and abandoned as unfit for agriculture by its previous caretaker. There was no water to be found even after drilling 600 feet at 5 different places and soil was just the name for a loose collection of small rocks. But the good thing(!) was the abandoning had happened 3 years prior to our coming back to India. Good rains had recharged the ground water. To rejuvenate the soil, we had planted a dense mix of pioneer crops (mix of grains, pulses, oil seeds, spices and grasses). At first, we didn’t even notice the Thuvarai. It grew real slow for the first 3 months. And then we saw it – everywhere. Its growth was eclipsing the tree saplings and most people advised us to take them down if we wanted the tree saplings to get any bigger than saplings. At that time, Thuvarai plants were beginning to flower and we didn’t feel like pruning them, let alone uprooting them. It was such a beautiful sight to see yellow flowers everywhere. 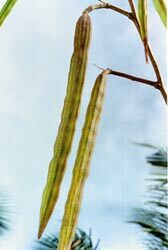 The flowering of Thuvarai was out of out of step with its season and so the pods were empty and no harvesting was done. And then the giant plant started shedding its leaves. A few weeks later, we were walking in the farm and we saw a dense yellow-brown blanket suppressing even very tall weeds making its shade clean and soft. Curious, I dug up the soil and felt moist rocks. A week later, I went there again to fix a leak and got distracted by the missing blanket. For the first time in our farm, I saw RED top soil! The leaves had compltely composted along with the grass underneath and the rocks had transformed into mushy little soil balls. And I understood the textbook talk about 2:1 dicot and monocot ratio producing excellent humus. Post leaf-shedding, it was the perfect time to prune these life givers so the tree saplings underneath could take in more sun light. And almost all Thuvari plants have sprung back to life for Season 2 of giving. The question it left us with: To rejuvenate the soil, many natural farming experts like Dabholkar advocate ploughing in pioneer plants like Thuvarai just before they flower. And then the land is to be left alone for 200 days. But the magic seems to happen in a much more dramatic and voluminous fashion upon full maturity of the plant in the course of its own natural cycle. We are looking to reconcile the expertise and experience from any one who can help. Thanks for sharing this. I am have small backyard garden about 1500 sft and thuvarai grew on its own. It just starting to flower and I will watch its cycle and add what I see from now. Enjoy the magic unfold..where is your garden?